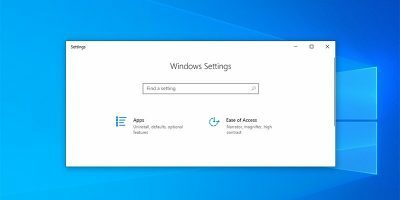 Deleting files is as easy as pressing the delete button or selecting delete from the context menu of the selected item, but do you know that a simple delete in Windows doesn’t actually delete the file. It just free up the hard drive space, ready for other files to overwrite it. Until that happens, that supposedly deleted file can still be recovered using some recover software. 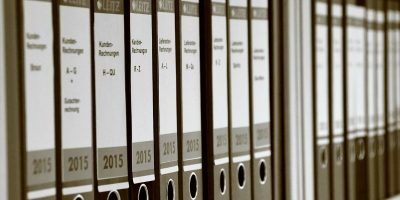 The question is – how do I delete files so that they are really, deleted? 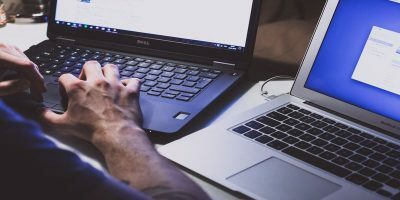 To securely delete a file, it is very important to overwrite free space and the deleted data with random stuff so that the original files and folders will never be able to be recovered again using any kind of recovery software. 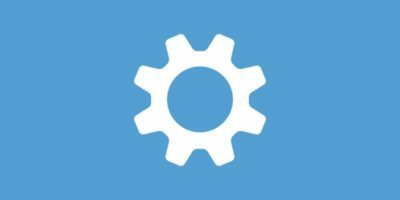 Although there are several free software available which can securely wipe out the hard drive, xShredder is one open source app we will be using. 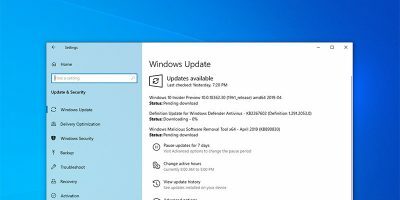 If you are running xShredder on Windows Vista or Windows 7, you will need to run it with administrative privileges. Otherwise it will give an error. To run xShredder with administrative privileges, just right click on xShredder shortcut on Desktop and select “Run as administrator”. The first thing you will notice while running xShredder for the first time is that it is in Dutch language by default. You can change the language by going to “Options -> Language (Optionen -> Language, Sprache)”. There are four tabs on the main interface of xShredder. Saved erase jobs contains all the jobs that you have created. 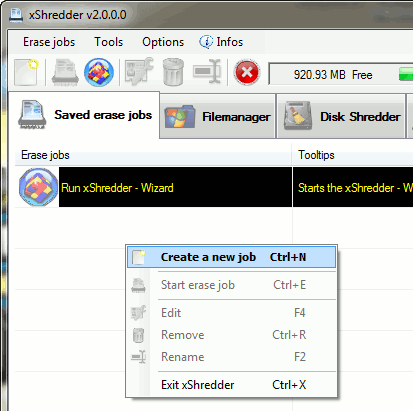 You can run xShredder wizard in order to create a new job or just press “Ctrl + N” to create a new job directly. The steps to securely erase a file using xShredder are a little complex and confusing. So I am giving a step by step process of erasing one file securely. 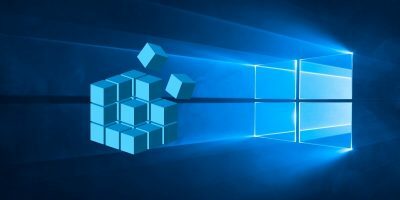 You can apply the same method to securely delete multiple files, folders or even drives. Download xShredder, install it and run with administrative privileges. Create a new erase job by pressing “Ctrl + N” in the Saved erase jobs tab. 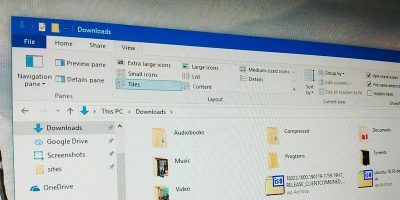 A new window will appear with two tabs – Filemanager and Deletion request. First go to “Shredder -> Options” in the menu and select the deletion method. There are several deletion methods supported by xShredder including simple method which overwrites data only one time to Peter Gutmann method which overwrites data 35 times (obviously taking more time). Under Filemanager, select the file or folder you want to securely delete. Right click the file and select Paste in deletion request -> Paste selected object (s). If you want to select all the files, select “Insert all files and folders”. 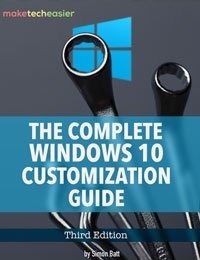 Please note that if you want to browse different drives, just press F5 and you will a list of all your drives in the computer. Choose all the files that you want to securely delete and keep repeating step no. 3. After you have selected all the files, open the second tab “Deletion request” and press “Ctrl + S” to save the deletion request that you have just created. Now close the deletion request window and go to the main xShredder window. 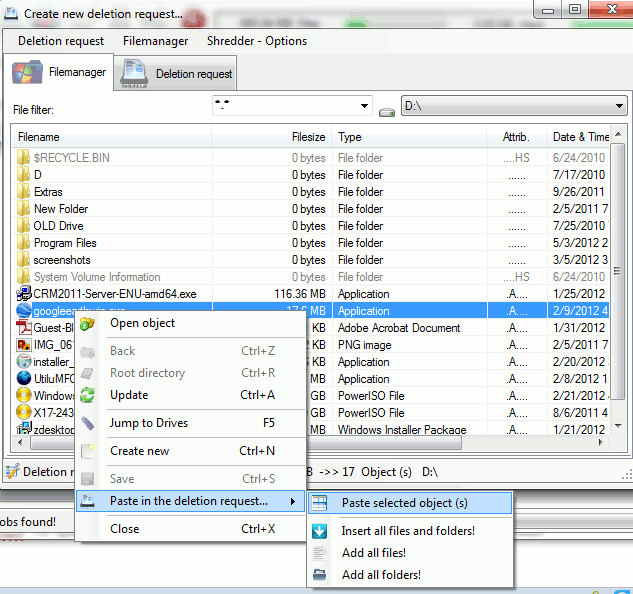 You will see that the newly created deletion request has been added to Saved erase jobs tab. You can start the erase job by right clicking and selecting “Start erase job” or simply pressing “Ctrl + E”. After confirmation, the erase job will start and will take some time depending upon the deletion method and the size of files to be deleted. Although xShredder is a complex program but once you start using it, you’ll start loving it. 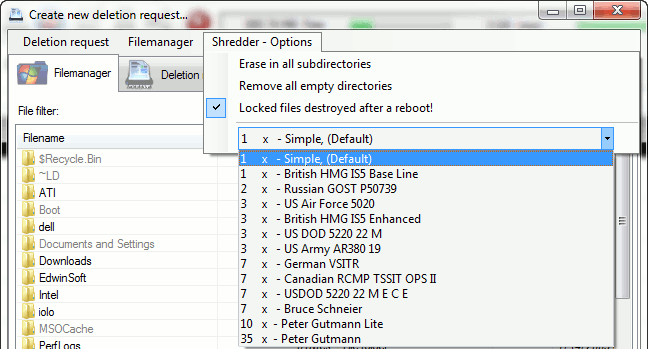 The greatest feature of xShredder is the number of deletion methods that it supports. 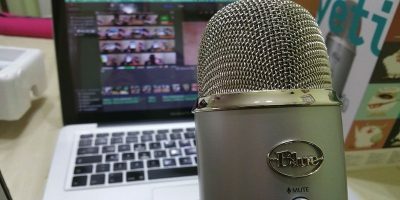 What are your thoughts about this free software? You may also consider reading how to delete files securely in Ubuntu Linux and deleting files on a Mac. Image credit: Businessman by Big Stock Photo. Can I delete (via del button) the data xShredder used to overwrite the file I first wanted to delete? If yes, how?